The Twinsie Tuesday prompt this time around is grey and gold and I have some dark grey nails with gold lace half moon stamping. I don’t personally think grey and gold go brilliantly well together. Grey is a cold colour and gold is a warm one. Grey goes much better with silver I think. So to make it work, I chose a darkish grey that could almost be black (Essie Cashmere Bathrobe), and stamped with gold. I think they go OK together. I used one of the Bundle Monster blogger collaboration plates, from set 2, BM-XL206. This is Nailstamp4fun’s plate – thanks Swanette. Her plate has a large lace design and some smaller, lace patterns, floral designs and a couple of a geometric images too. I used one of the French tip lace designs and decided to use it as a half moon stamping instead of a tip. I love this Bundle Monster set and have more designs using other plates coming up soon. You can buy this plate on its own from the Bundle Monster website for $4.99, or you can purchase the entire set of five plates for a slightly less per plate, at $19.99. All manicure images are copyright to Kerruticles unless otherwise mentioned. The stamping plate image is copyright to Bundle Monster and is reproduced here with permission. 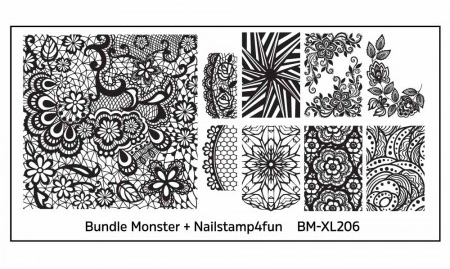 The Bundle Monster stamping plate BM-XL206 was sent to me for review. All views expressed in this post are my own, honest and unbiased opinions. That lace stamping design is so intricate. Its gorgeous! You’re so right grey goes much better with silver than gold, but boy did you make it work! This is a very sophisticated and pretty design! I love the subtle shimmer in the your base polish – it compliments the gold stamping. I too used a dark grey base for my mani.